1. Preheat oven to 180 deg celcius. 2. Mix all the ingredients together in a food processor or with an electric beater until it all clumps together to form a dough. 3. 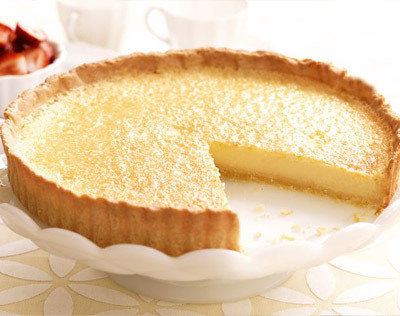 Press into a lightly greased 24cm tart dish. Chill in the fridge while preparing the filling. 4. Heat the milk in a medium pot (do not boil). Beat the yolks and sugar until creamy and light then add the flours and salt - the mixture will be quite thick. 5. Add some warm milk to the egg mixture and then return all of it to the pot. Bring to the boil and whisk constantly until thickened. 6. Remove from the heat and whisk in the butter and vanilla. Whisk the egg whites in a clean bowl until soft peaks form and fold into the custard. 6. Pour into the chilled pastry case and sprinkle with cinnamon.